As wonderful as it is when served hot, the rich, earthy flavors of this dish actually seem to become more intense when it’s served at room temperature. 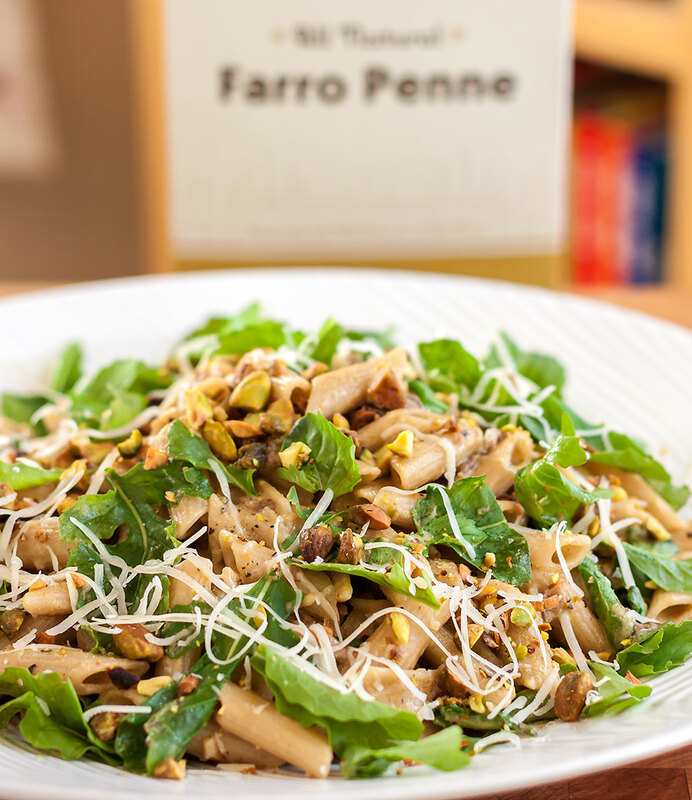 Earthy Delights’ new line of Foraged Fare Farro Penne is the starting point for our pasta dish, and is the perfect base for building layers of flavor that enhance and complement the naturally warm nuttiness of farro. In a surprising twist, the creamy sauce which permeates and coats the pasta contains no milk or dairy products; instead, it’s produced by whirling roasted pistachio nuts in a blender with chicken or vegetable stock and the flavorful liquid left from from soaking dried porcini mushrooms. Farro, in case you’re not familiar with it, is an ancient grain closely related to modern wheat. The cultivation of farro predates the Romans, and 2,000 years ago was grown across much of the Near East and the Mediterranean world, where it was a staple in every household. Farro has remained popular in Europe, but most especially in Italy, where it still is consumed regularly. In recent years, farro has experienced a resurgence in popularity here in North America, among both gourmets and health-conscious diners, who enjoy it not only for its nutritional value, but also for its earthy flavor. Eaten in its whole grain form, farro requires overnight soaking and long simmering before it becomes tender enough to eat. Our solution? 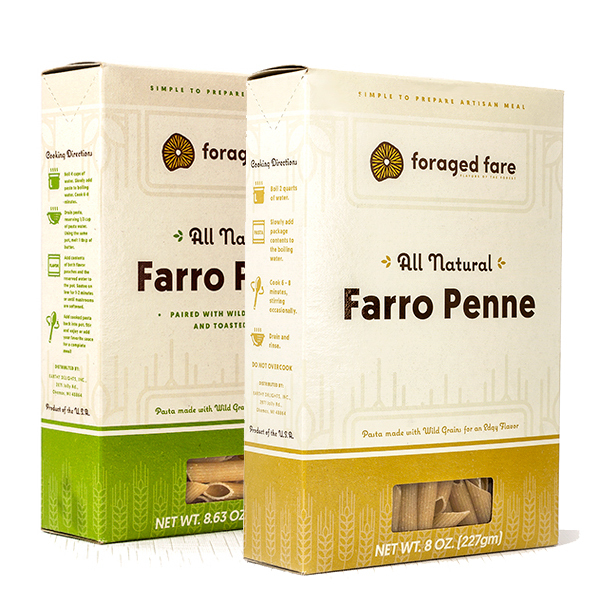 We combined unbleached, all natural farro flour and pure water and created a flavorful, wholesome penne pasta that’s simple to prepare. It’s as easy as boiling water, and with a cooking time of 8 minutes or less, you can enjoy hearty, nutritious farro any time you want. Rich, colorful pistachios team up with dried porcini mushrooms and nutty farro penne for a robustly flavored pasta dish that the whole family will love. 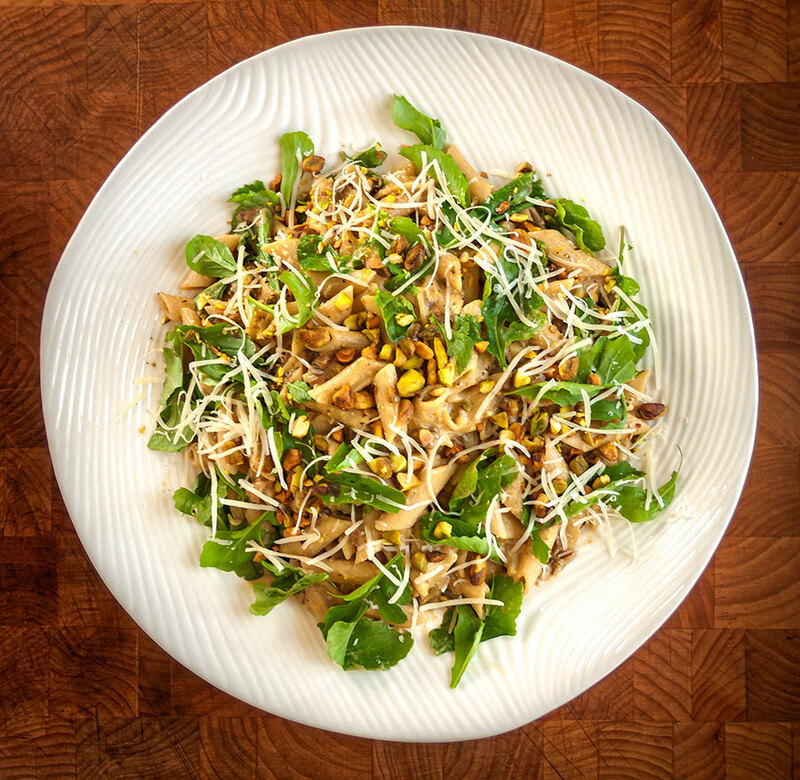 Fresh arugula adds a bright, spicy note as a counterpoint to the earthy pasta and the creamy nut-based sauce that coats it. 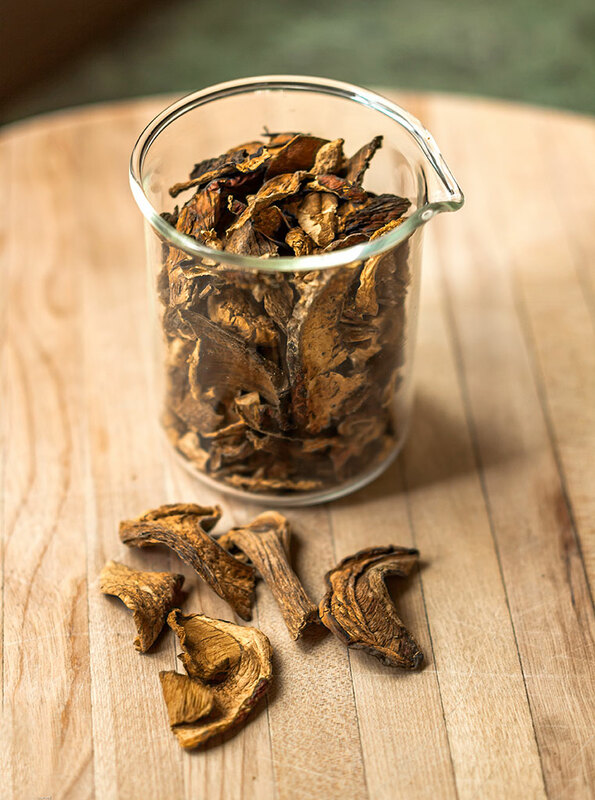 Place the dried mushrooms in a small bowl and cover with hot water (about 2 cups). Allow to stand until the mushrooms are pliable and fully rehydrated, about 30 minutes. Strain, reserving the soaking liquid. Rinse the rehydrated mushrooms under cool running water for a minute or two, then drain again, gently squeezing to remove most of the liquid. Turn onto a cutting board, chop coarsely and set aside. Coarsely chop 1/4 cup of the pistachios and set aside. Put the remaining 1/4 cup of pistachios in a blender with the chicken or vegetable stock, 1/4 cup of the reserved mushroom soaking liquid, the sherry vinegar and a pinch of salt and pepper. Blend until very smooth, about 3 minutes. Heat the olive oil in a large skillet over medium high heat. Add the rehydrated mushrooms, sprinkle with salt and pepper, and cook, stirring occasionally, for 2 – 3 minutes. Stir in the chopped garlic and cook for another minute. Add the dry sherry and bring to a vigorous simmer. Cook until the liquid has reduced by half, about 2 minutes. Meanwhile, cook the farro penne in a large pot of boiling salted water until still slightly firm in texture, about 6 minutes. Drain, reserving 1 cup of the cooking liquid.